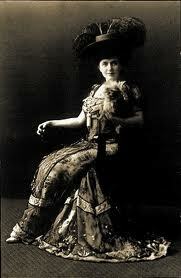 ” A Peach”, ” man-crazy”, ” a free-spirited ingenue”, ” the most beautiful woman in California”. My distant cousin was called all these things and much more, some less than flattering. 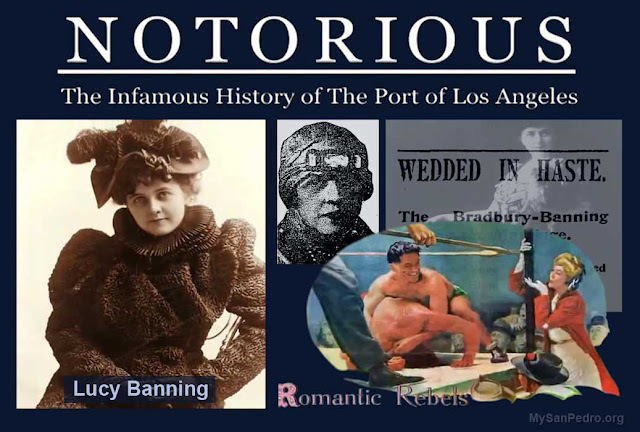 Lucy Banning was one of the richest and most beautiful women in the latter part of the 19th century, a time when Victorian rules where the name of the game, but Lucy had enough dough to play by her own rules thanks to a inherited fortune from her old man, ” Transportation King”, Phineas Banning and the financial windfalls she collected thanks to her gaggle of wealthy ex-husbands. Lucy was born in1876 in the 23 room greek revival mansion in Wilmington that her Dad had built in 1864. (still there, site of the Banning Museum). A young gal when Phineas called it a day she now had dough and wanted out of Squaresville Wilmington. Her many suitors included the handsome young attorney Johnny Bradbury whose Pop was a gold-mining and real estate tycoon. The family’s name is commemorated by the famous Bradbury Building in downtown L.A., the town of Bradbury, and Bradbury Estates. Lucy and Ward were charged with adultery, but like the cavalry of the old west, Lucy’s Mom came to the rescue and paid off the “Society for the Prevention of Vice” and the charges against her were dropped. Not so for the polo playing Ward who faced the charges alone. Johnny Bradbury stated that “H.Russell Ward had exerted an undue influence over my wife, and that she would never have done what she did had it not been for his uncanny spell over her.” Reconciliation seemed complete and bliss resumed, but not so for the unfortunate Mr. Ward. Johnny Bradbury is not the first nor the last, to find that a strong nudge to the small of the back from a speeding train can make certain troublemakers go away – for this was the fate of Mr. Ward. Suicide, accident, or murder Mr. Ward would not embarrass J.B. again. Lucy’s marriage would not endure. After moving to Mexico and returning to Los Angeles divorce proceedings from J.B. were under way – for Lucy again fled to San Francisco. Just two months after the divorce, Lucy took up with Charles Hastings of Pasadena. Rumors concluded that the two would marry, but these predictions did not come true. Lucy took up acting (translation: she took up actors) and soon married Shakespearean actor Mace Greenleaf who worked at the Burbank Theater (see what happens when you slip on some tights). Mace was no Romeo off stage so Lucy dumped him and married Robert Ross, the son of a prominent judge. “I am through experimenting, I am prepared to settle down” declared Lucy then 42. And so she did until 1925 when she went to the Olympic Auditorium and laid eyes on Japanese wrestler Setsuzo Ota. Witnesses said “she tossed her evening handbag into the ring at Ota with her calling card inside.” Lucy went to Ota’s hotel room and “she took my shirts, ties, everything out of the closet and dresser, put them in a suitcase, closed it and said “We go now.”, Ota exclaimed. Ross divorced her and Lucy, 51 and Setsuzo, 31 drove to Seattle (interracial marriage was not allowed in California) to be married. This marriage did not last long either, but not because of the usual reasons. While vacationing in Italy Lucy caught pneumonia and passed away, shortly after her 53rd birthday. According to Ota, Lucy knew she was dying and her last words were “I’ll get criticized for this too.” Lucy left almost $400,000 to Ota, but because of lawyers and family disputes he walked away with $6,000. Setsumo Ota took his own life in 1963. So comes the close to a wild gal who set her own rules, took advice from few, and lived the untamed life on a path she choose alone. Many thanks to Tom Sitton, author of ” Grand Ventures, The Banning Family and the shaping of Southern California”.